At Raxter Law, we’re a community-centered, neighborhood law firm that help individuals, families, entrepreneurs, and businesses protect what matters most through cost-effective legal services and representation. Our Menifee law office empowers your legal decision-making with personal, informative, relaxed, and educated legal services. We build long-lasting relationships with our clients, because we know that it’s difficult to work with a lawyer who doesn’t take a personal stake in the outcome or who doesn’t know you of understand the intricacies of your situation. 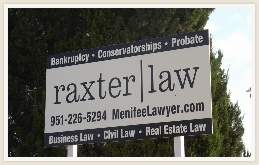 At Raxter Law, you’ll work with a professional and savvy lawyer who you can actually understand. The office is relaxed and designed with the client in mind. Our focused approach to legal services ensures that all of your bases are covered, and we’re knowledgeable the nuances of the law within our practice areas. We’re savvy, relaxed, and ready to assist you with your legal needs. Check out our PRACTICE AREAS. We have assisted clients, families, small and large businesses, non-profits, and even cities with legal issues. Serving Clients in: Canyon Lake, Homeland, Romoland, Lake Elsinore, Wildomar, Hemet, Winchester, Menifee, Sun City, Perris, Murrieta, Temecula, San Diego, Anaheim, Orange County and San Diego Counties. Local Law Office serving clients in Menifee, Canyon Lake, Perris, Murrieta, Sun City, Hemet, Romoland, Nuevo, Riverside, Los Angeles, San Diego, and San Bernardino Counties.